I was a young Philadelphian, freshly divorced, and looking for a new city in which to start my new life. I was tired of rat-filled alleys and dirty heaps of black snow that lined the streets like piles of coal. At a library, I happened upon a travel magazine. And on those glossy, full-color pages, I spotted a picture of the Saint Paul Winter Carnival. The photo stopped my heart. The ice castle lit up the night like a neon rainbow. The air around the castle glowed brilliant colors, and the blocks of ice were impossibly beautiful, translucent, and heavy as God. This was nothing short of a winter masterpiece. The frozen palace promised wonderful possibilities and magical thinking. Plus, it was surrounded by clean, soft, fresh snow. 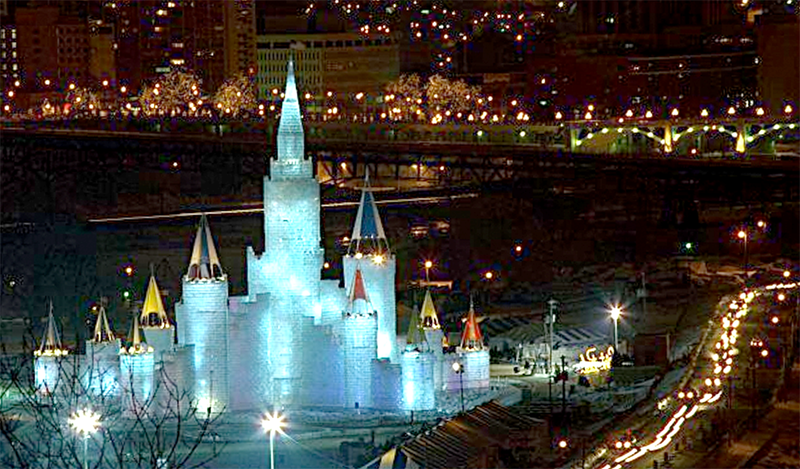 I made up my mind then and there: I had to live in Saint Paul, because any city that would build a sparkling ice castle every year was definitely the place I would want to claim as home. Fifteen years later, I am still here. And though our city most definitely does not build a pretty ice palace yearly, it does not matter. It does not matter. Susan Solomon is the editor/cartoonist of Sleet Magazine, an online literary journal.